I have been struggling to find a way for my kids to use our class word wall and they never seem to use it as a resource. Sometimes when it is not directly in their hands they just don't refer to it. I decided to create a portable word wall for them to keep in their writing folders. Every week when we add new words they will highlight the words we have learned. 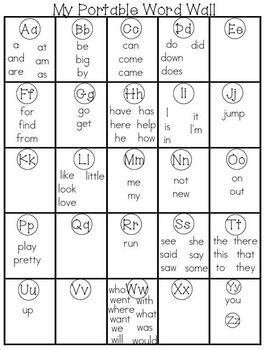 This way they have a resource and for my readers they also have all of the sight words that will be introduced. You can photo copy and give out to each of your students. They can highlight as new words are introduced. Another idea if you want them to last and be a littler sturdier is to laminate the word wall and then use highlighting tape to highlight new words or even underline in a sharpie.